U.L. 1008 Listed (File No. E32008), these Electromechanical Automatic Transfer Switches are rated for applications 100A to 4000 Amps, up to 600 Vac with interrupting ratings of 35kAIC@480Vac thru 150kAIC@480Vac available. The Electromechanical Automatic Transfer Switches offer the robustness of electromechanical controls along with their simplicity of troubleshooting. They are provided with the same features found on the microprocessor controlled ATS and may be used in both Molded Case (MC), Insulated Case (IC) and Vacuum Breaker (VB) Series Transfer Switches. 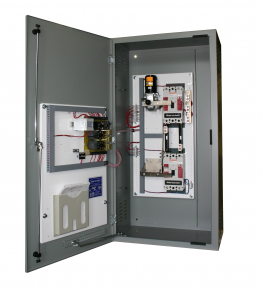 The MC and IC transfer switches come with both electrical and mechanical interlocks. The interlocking mechanisms are located behind the molded case units and to the right side of insulated case units, to prevent accidental paralleling of the sources. All of the VB series transfer switches are electrically interlocked. Depending on the manufacture of the circuit breakers, a mechanical interlock may also be available. The interlock is to prevent accidental paralleling of the sources except were temporary source paralleling is required. See Closed Transition Transfer (CTT) cutsheet for more information. These ATS have mechanical barriers to isolate the operator(s) from any live parts when performing maintenance on the ATS. This helps improve their safety. Corporation is one of the oldest and most widely recognized manufacturers of Switches & Switchgear, Cabinets & Controls.